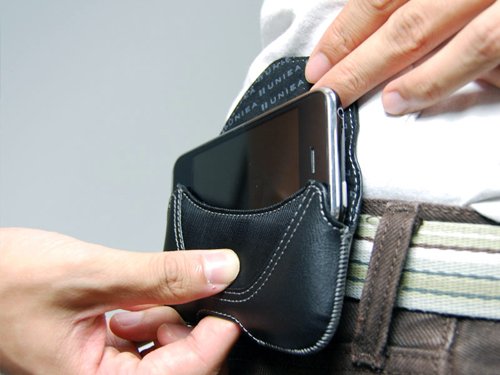 “Cases that hook onto your belt have long been considered ‘nerdy’,” asserts the promotional copy for the new UNIEA U-Hip Pop leather case for iPhone 3GS/3G and iPod Touch. Given that I, too, have long been considered “nerdy,” it would seem that the U-Hip Pop case and I are a match made in heaven. But alas, the UNIEA folks then go on to point out that they have “reinvented the belt case” with the U-Hip Pop, proclaiming that “its hip, svelte design looks very natural and trendy.” Well, as I’ve never been accused of being hip, svelte, natural or trendy, maybe the U-Hip Pop isn’t cut out to be my soulmate after all. For what it’s worth, the name “U-Hip Pop” conjures up visions of the Dr. Seuss books I read as a child, although a hasty deconstruction reveals that it refers simply to a UNIEA case, worn on the hip, from which you can pop out your iPhone. ”The U-Hip Pop? 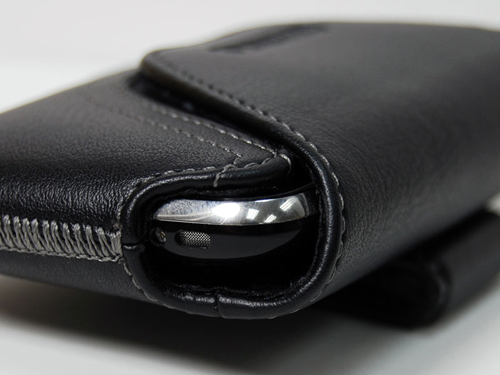 That brings to mind/A Dr. Seuss book of some kind.” Actually, it’s an iPhone/iPod Touch case which, as shown here, resides on the wearer’s hip, and features an opening in the bottom used to pop out your iPhone. Literary references aside, the U-Hip Pop is an attractive, well-built and sturdy case which, due to its sideways orientation, allows me to bend over at the waist without causing my iPhone to poke me square in the ribcage. And because it’s worn out on my left hip, I don’t have to fumble to extricate a ringing iPhone from my front pants pocket whilst I’m seated, or piloting the AltiM@c minivan to a Mac emergency. 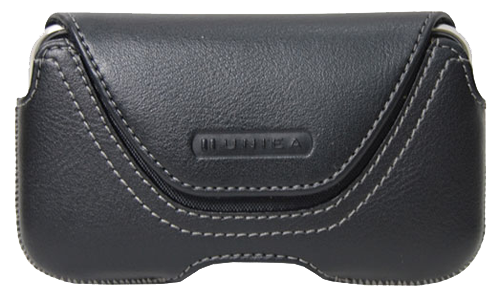 The edges of the U-Hip Pop’s front flap are elegantly rounded off in what UNIEA deems a “wave” shape, and the corners of the case are softly rounded as well; the black leather exterior is a rich black but not glossy or shiny, with the overall effect being that of a very soft and natural accessory. In spite of its “natural and trendy” looks, the U-Hip Pop’s construction is first-rate. The belt clip is steel wrapped with leather and held on by no less than 40 tiny stitches, while the thicker and even more extensive stitching at the sides of the case gives it an almost indestructible feel. The front flap is subtly embossed with the UNIEA logo, and closes magnetically with a muted but reassuring “clop” sound. Strangely enough, the product info in one section of the U-Hip Pop’s Web page touts the case’s “unique, wave-shaped Velcro flap,” while just a few pixels down and to the left, we learn that the flap opens “without use of buttons, zippers or Velcro.” Personally I’m happy they skipped the Velcro, as neither I nor anyone in my immediate vicinity needs to be subjected to the sound of hundreds of miniature hooks and loops separating noisily, informing everyone within earshot that you’re reaching for your iPhone, even though you made sure to silence the ringer beforehand. ”Would you wear it on your hip?/Would you take it on a trip?” Sure, why not? I prefer belt-clip cases like the U-Hip Pop because they avoid the difficulties inherent in retrieving your phone from the your front pocket while you’re seated at a conference table, or worse, when you’re driving. 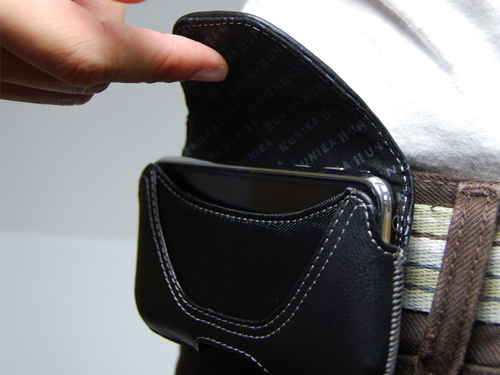 The U-Hip Pop’s magnetic flap, shown here, closes securely but is easy to flip open when accessing the phone. Although I have no plans to conduct drop tests with my iPhone 3G, a thorough inspection of the materials and construction of the U-Hip Pop appears to indicate that it will hold its contents securely and absorb a reasonable impact, while protecting the precious cargo encased therein. Unfortunately, my initial experience has been that the U-Hip Pop actually grips my phone a bit too tightly, making it more challenging than I expected to pop the phone free by pushing up from the opening at the bottom. It may be that this will be less of a problem as the case becomes broken in, but only time will tell. ”With iPhone housed in U-Hip Pop/Would you subject it to a drop?” Given the materials and the construction of the U-Hip Pop, I feel pretty safe relying on it to protect my iPhone 3G from the slings and arrows of the Mac consultant’s appointed rounds. Here you can see the robust stitching found on the sides and bottom of the case. Otherwise, I have only the usual complaints that accompany any belt-clip case, the first being that if you don’t slide the phone in the “right” way (bottom of the iPhone facing inward) you lose access to the headphone jack, volume buttons and ring/vibrate switch. This issue, as with many challenges in life, is overcome only with practice. My other complaint is simply that the U-Hip Pop, as with most cases that attach at the hip, does not include belt loops on the back of the case. In my humble opinion, this simple addition would save wear and tear on the clip itself, while providing a much more secure connection to the wearer.